SaveAllAttachments is a free Microsoft Outlook 2007 add-in that adds the option of saving and removing attachments from multiple emails. This is pretty useful add-in as there are may be instances when the damn pst file is growing in size over a period and we need to remove attachments to control the file size. 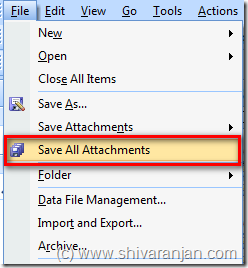 SaveAllAttachments offers two options for attachments: 1. Save all the attachments from multiple emails and 2. Save and remove all the attachments from multiple emails. When you use the option 2 i.e Save and remove all the attachments from multiple emails, all attachments are saved in a folder and a link is left in the email message body with location of actual file. The option to save attachments can be found under ‘File Menu>>>Save All Attachments’ and this option gets highlighted only when the emails with attachments are selected. To use this add-in Microsoft .NET 3.5 SP1 is required and this add-in can be used with ONLY Outlook 2007, all the previous Outlook versions are not supported. It is perfect time to make some planms for tthe longer term and it’s time to be happy. this article. I desire to rea more things about it!